The Catholic Foundation of South Georgia is a non-profit, independent charitable foundation that exists to to provide effective stewardship of philanthropic assets entrusted to its care by donors who desire to advance the religious, charitable and educational works of the Catholic Diocese of Savannah, its parishes, schools and agencies. 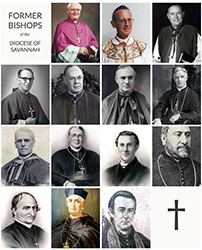 In 2001, the Catholic Foundation was established as a nonprofit, independent charitable foundation to provide endowments for the Diocese of Savannah. It was in the Fall of 2005 when the Board of Trustees held its first meeting to begin creating endowment funds. We invite you to learn about the Catholic Foundation, its purpose and the many ways we encourage philanthropy in our Catholic community. As a Catholic Foundation, we tailor giving to the needs and interests of individual donors by offering tools, insight and inspiration to help make giving effective and satisfying. Giving to the Catholic community is about your life, your commitment and your passion to preserving a faith and a heritage to be shared for generations to come. The Catholic Foundation measures its success in terms of the many individuals, families, parishes and schools who have entrusted us to be stewards of their charitable interests and in how well we make a difference in the lives of others across the Diocese of Savannah. Why have a Diocesan Foundation? While when it comes to eternity, “You can’t take it with you” as the saying goes, is true, the opportunity to create a perpetual endowment to leave behind is readily available. Is there a foundation in your future? Thinking about “end of life” issues is not the cheeriest of meditations, but it is important. Relax! Breathe! It’s not happening now. The Flannery Trust Fund was initially created in 1903 by Captain John Flannery with a $50,000 donation, which would equate to $960,000 today.